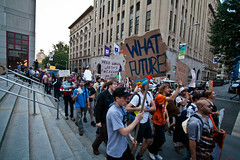 Journalist and Reason contributor Michael Tracey is covering New York’s Occupy Wall Street as it’s happening. Above is footage he shot as the protesters marched through the street of Manhattan and had various stand-offs with the New York Police Department. Tracey himself reports being punched in the shoulder while filming. WASHINGTON, Oct 13, 2011 (IPS) – While the administration of Barack Obama vows to hold the Iranian government “accountable” for the alleged plot to assassinate the Saudi ambassador in Washington, the legal document describing evidence in the case provides multiple indications that it was mainly the result of an FBI “sting” operation.